If you’re anything like me, I tend to overbuy fresh herbs and always have leftovers after making the only recipe I intended to make. Then I’m stuck with figuring out what to do with the extras. This time, I was left with some mint from a delicious, fresh strawberry-mint frozen yogurt, so I decided, why not try a pesto? Cut top off bulb of garlic to expose each clove (about a quarter of the top of each clove should be removed); peel off loose outside layers. Sprinkle the top with olive oil and wrap in aluminum foil. Roast in oven for 30–35 minutes. Set aside to cool until easy to handle by hand. Coarsely chop basil and mint leaves. Combine basil, mint and chopped walnuts in food processor and process until fine. Add 4 cloves of roasted garlic to food processor (just pinch the uncut end to squeeze the garlic out from the skin) and process until combined. Slowly add lemon-infused olive oil (or olive oil plus lemon juice) to food processor; continue to blend until well mixed. 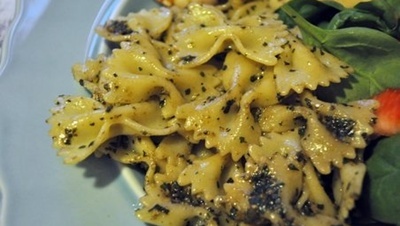 Stir pesto into cooked pasta, toss with vegetables or shrimp, or brush over salmon or chicken.